Baltimore Ravens head coach, John Harbaugh, spoke to the media for the first time today since his press conference that followed the team’s loss to the Chargers in the Wild Card round of the playoffs. Between the Ravens’ untimely exit from the playoffs and this point, the Baltimore Ravens concerned themselves with negotiations to extend coach Harbaugh’s contract. On Saturday, it was reported by ESPN’s Chris Mortensen that the Ravens reached a deal in principle with Harbaugh. The report was later confirmed by Ravens insiders Jeff Zrebiec of the Athletic, and Jamison Hensley. The deal extends Harbaugh’s contract by four years into 2022. The monetary value of the contract extension has not been made public. 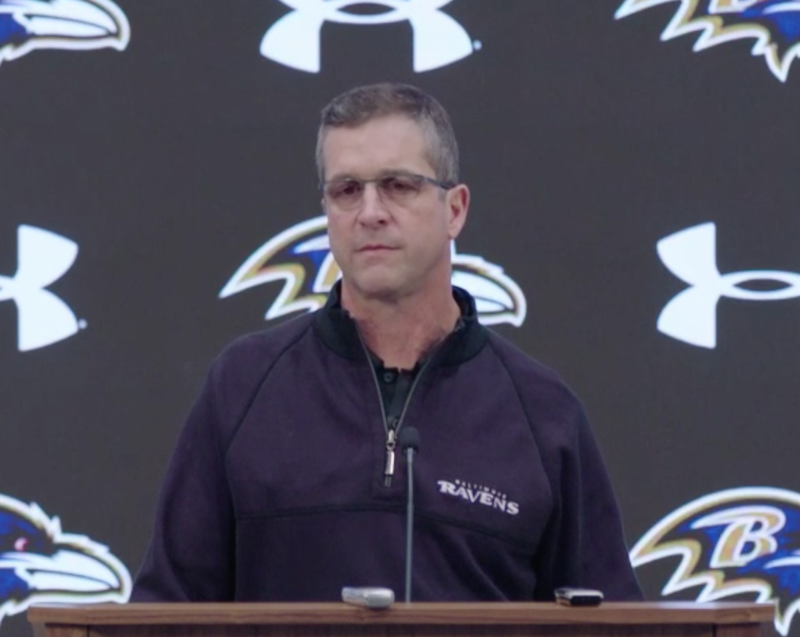 Here are five takeaways from John Harbaugh’s press conference. Harbaugh confirmed that the Baltimore Ravens will not be the same team on offense in 2019. The Ravens in 2018 relied heavily on the run and gave Lamar Jackson the responsibility of running the ball more than anyone else. As many expected, the Baltimore Ravens will change this philosophy in 2019. Harbaugh said that the Ravens will start from scratch on the playbook, but the team will still be a run first based offense. He stated that the effect Roman had on the run game was one of the reasons he hired him as offensive coordinator. The team “will be a different team than we were last year. We’ll be a different team than we ever were before,” Harbaugh stated. He left no speculation about change, but the question remains on how much the Ravens will change. One will have to wait until the preseason to see the changes in action. When asked if he thought about potentially coaching another team, or if he found solace in the idea that any other team would hire him in an instant if he was available, Harbaugh said, “Okay, uh, yes everybody gives thought to those things. Did it give me solace? I don’t know, I can’t remember. I’m just appreciative to be here.” Talk circulated in both media and fan circles at midseason of a potential split between Harbaugh and the Ravens. The general consensus was that all teams with coaching vacancies would fight to hire Harbaugh. Harbaugh confirmed that he had these thoughts as well, but was very appreciative to be back in Baltimore. He made it clear that Baltimore is the only town he wants to coach for, and that he loves the organization and is very happy to be back with the Ravens. John Harbaugh wanted to keep his offensive coaching staff together for 2019, but after setting that goal, turnover infected the organization. Harbaugh replaced offensive coordinator Marty Mornhinweg and replaced him with run game specialist/tight ends coach Greg Roman. Harbaugh offered Mornhinweg a position on the staff in 2019, but Mornhinweg declined it. The Ravens moved wide receivers coach Bobby Engram to coach the tight ends and lost running backs coach Thomas Hammock. Hammock accepted an offer by Northern Illinois University, his alma mater, to become the team’s head coach. Since these changes, coach Harbaugh and the Ravens have made no other changes to the roster, but he stated that he is in talks with many candidates to fill the vacant roles. “Unless something changes, they will be back,” John Harbaugh said about the situation surrounding veterans Eric Weddle and Marshal Yanda. “I want them both back for sure.” Coach Harbaugh is obviously a fan of both Weddle and Yanda, but the stark reality is that each could be cut to build salary cap space. Harbaugh alluded that the whole organization is on the same page about offseason moves, and wants to get both of these guys back. Ultimately, however, the decision will fall to new general manager Eric DeCosta. The funniest moment of the press conference came when Harbaugh mentioned that he went to Chick-fil-A, and told his father, only to have his father ask who Chick-fil-A is. Here is a clip of the scene.